Recycled objects create the basis for beautiful basics in the bathroom. 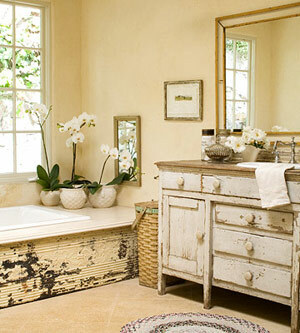 Add patina to a tub surround by framing the base with salvaged paneling. Here, a weathered piece of tin does the job. The vanity is an antique cabinet retrofitted with a new sink and faucet. While browsing through Better Homes and Garden online, I found the perfect inspiration for a console I saw at the urban market. I came across this wonderful bathroom and instantly I knew this was the look. I love the weathered casual decorating style with the uses of pale or faded colors. I have always loved colors and a great find at the flea market! 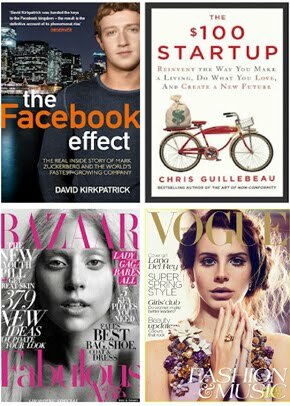 Here are a few more inspiration photos, what do you think? Are you drawn to shabby chic decor? i do love shabby chic decor in combination with a few modern pieces...it's the whole modern mix trend that i am intrigued with. great inspiration photos! I love all the bright pictures! They look so fresh! There's that unmistakeale classical touch in these designs, without looking too antique. travel and it now supports multitasking. social proof using your wall ' all you need is few people who write on your wall on regular basis. in such a high pressure situation, Larsen's feat is even more impressive when one considers that the Dodgers had four future Hall of Famers in their lineup: Duke Snider, Jackie Robinson, Roy Campanella and Pee Wee Reese. Harry Potter Hogwarts is one more entry into this new series of LEGO board games. 7 platform. They get their revenues only from the commercials and hence, they charge nothing from their customers. will allow you to develop and save your own playlists that contains your favorite songs. talk radio station from the comfort of their home. a world, have become basically addicted and dependent on our radios. then move on play more games. The only downside of it in a lot of people's eyes is the fact that there is no multiplayer content. If you want to be able to hit the ball further and harder, you should keep in mind to keep your grip on the bat loose, your swing should begin with your legs and hips, and finally, you must always follow your bat through. rows of pirates ship from making their way down the river. river. Are you a Kansas City Chiefs or Pittsburgh Steelers fan. An easier way to ensure someone is 'out of sight out of mind' on Facebook is to simply hide them. others, this station also showcases the work of and connects with indie artists from all over the globe. with the listeners of the online radio community. little or no return on your investment. The interface is user-friendly and intuitive, providing you with an easy way of navigating through the settings, configuring playlists and managing your media collections. listeners of the online radio community. Around 150 games in total, but that's relatively small compared to our users. A bowler who can consistently pick up his spares can easily hold a 180 average without getting any strikes. It can go as far as ruining their experience since it is the last interaction they have with a game. channels from all over the world. This means that you don't have to purchase additional hardware to be attached to your device or install another software program for you to enjoy online streaming radio.